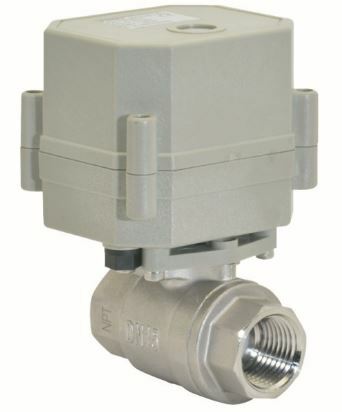 PVP2XX Series, 2/2 Way Stainless Steel FULL BORE Proportional Electric Ball Valves. These Valves open proportionally as the control signal increases from 4mA (Closed) to Fully open at (20mA). The DC Type uses only mili-amps, during movement time to open and close and can thus be used for months or years on small batteries. (Ideal for remote control) Features: Motor Enclosure:IP65 Body Material Stainless Steel 304 PTFE Ball seals and FKM(viton) stem seals Media Pressure: 0-10 Bar Medium temperature: Minus 2 to 95 Degrees C. Voltages: DC9-24V Control signal: 4-20mA Standard(Optional Import 0-5V or 0-10V).